Bhojpuri melodious queen Akshara Singh keeps teasing her fans with her on and off set outings. Earlier today, she took to Instagram to share her series of pictures from her one of the upcoming films. In the picture, she is seen donning a heavy embellishment green lehenga and looks beautiful, as always. She has accessorised her look with a neck piece, a pair of earrings and perfect hair curls. She looks vibrant and her smile will take your breath away. Earlier, her Holi song titled ‘Sakhi Ke Marda Udawlas Garda’went viral on social media. In the song, Akshara is seen dressed in a yellow saree teamed up with long braided hair, sindoor, a pair of earrings, bold lipstick and stylish aviators. Her swag is bang on as she sits on a bike. The song has been crooned by Akshara Singh and the lyrics have been penned down by Manoj Matlabi. The music is directed by Ghunghru Ji. A few days back, she has also shred her picture dressed as a Muslim bride in a red lehenga. She looks drop-dead gorgeous and what we can’t miss is her features. We have to say she looks hot as ever as she smiles for the camera. She has paired off her look with kohled eyes and red glossy lipstick. 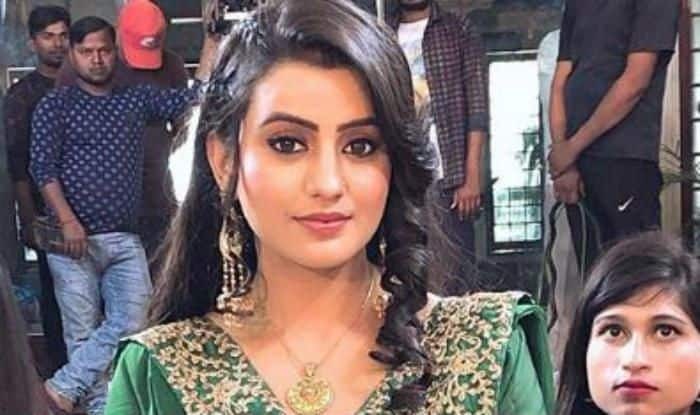 Akshara is known for her Tik Tok videos and keeps uploading them to social media. She rose to fame with songs such as Akhiyon Se Goli Mareba, Dhadkaa and Balam Ji Love You. She has worked in a number of Bhojpuri films with all the top Bhojpuri actors such as Ravi Kishan, Pawan Singh, Khesari Lal Yadav, Dinesh Lal Yadav, among many others.